With this February 2018 issue, Microbial Cell publishes its 50th issue since the release of the first one in January 2014. In the course of the last years, the journal has developed rapidly and reached a number of milestones, including the DOAJ award for high open access quality, acceptance into the Thomson Reuters/Clarivate ESCI index, or inclusion in Pubmed Central among others. We have published a large number of outstanding papers by leaders in their respective field of research, for example by Alexander Varshavsky, Dan Klionsky, or Guido Kroemer. In addition, we have started to produce a series of Special Issues with the first one already published (on sexually transmitted diseases) and several others currently in preparation. In fact, the number of views/downloads of our articles has risen considerably in the course of the last one and a half years and is currently at approximately 800 per day. 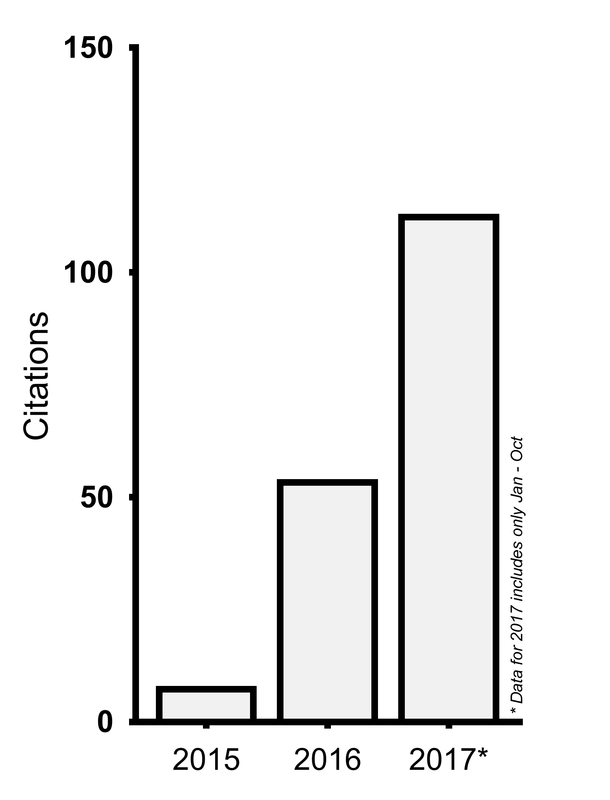 Most importantly, the number of citations has been steadily increasing (see graphic below). 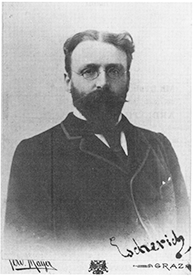 We expect to obtain an official impact factor in the course of this year. We thank all readers, referees, editors and authors for their great contribution to these successful 50 first issues and for their support in these early phases of Microbial Cell, a journal we understand to be crafted “from scientists for scientists”. Quality Open Access Market (QOAM) provides a quality assessment platform for open access journals. For that purpose, QOAM solicits the judgement of the academic community by asking researchers to score their experience with the publication process of their manuscripts in a given journal and thus share their insights with the community. We are happy to learn that Microbial Cell has scored highest in the so-called journal’s SWOT matrix, which classifies open access journals into four journal categories: (i) strong and (ii) weaker journals, (iii) those representing a threat (to authors) and (iv) journals which are an opportunity (to publishers). Microbial Cell has been ranked as a strong open access journal. We are especially pleased that Microbial Cell scored 4.9/5 points in the so-called Valuation Score Card, which is the actual reality check that mirrors author experiences with a journal. We will continue in this line of work to further maintain this level of quality and improve where possible. We also want to thank all authors that have shared and share their positive experience with us! One of Microbial Cell‘s Editorial Policies is to follow the recommendations by the International Committee of Medical Journal Editors (ICMJE), which reviews best practice and ethical standards in the conduct and reporting of research and other material published in medical journals (see our corresponding editorial policy). We are now happy to announce that Microbial Cell has officially entered the ICMJE journal list as a publication that follows these international standards. In July 2015, Microbial Cell was accepted for inclusion in the selective Directory of Open Access Journals (DOAJ). DOAJ is the reference whitelist for open access journals that meet the high standards in quality and peer-reviewed open access required by this organization. Now, we are proud to announce that Microbial Cell has been awarded the so-called DOAJ Seal, an exclusive mark of certification for open access journals granted by DOAJ to journals that adhere to outstanding best practice and achieve an extra high and clear commitment to open access and high publishing standards. The Seal thus acts as a signal to readers and authors that the journal has an exceptionally high level of publishing standards. You may learn more about the DOAJ Seal here. 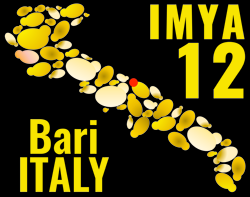 Microbial Cell is proud to be a sponsor of the 2nd International Symposium “One mitochondrion, many diseases” (Freiburg, Germany, March 9th and 10th 2016), a Junior Researcher Conference organized by Verónica I. Dumit (Freiburg), Florian Steinberg (Freiburg), Ralf Zerbes (Freiburg), Ralf Braun (Bayreuth) and Denis Gris (Sherbrooke, Canada), which aims at bringing local, national, and international junior and established senior researchers together that work on the molecular aspects of chemical toxicity and different diseases. The symposium intends to outline common and distinct roles of mitochondria upon these pathophysiological conditions. Researchers using different model systems, and applying various experimental approaches are highly welcome to attend and contribute to this symposium. Please visit the official conference website for more information, including the registration, program and venue! With the January 2016 issue, we celebrate Microbial Cell‘s 25th issue. Since it first appeared in January 2014, the journal has received more than a 100.000 page visits from more than 150 different countries. Notably, page visits have incremented by 50% between 2014 and 2015, demonstrating that Microbial Cell‘s visibility is rapidly increasing. In the course of these two years, Microbial Cell has received around 150 manuscript submissions from authors of all continents around the globe. The evaluation of these submissions was supported by the expertise of hundreds of referees across the world. We have published more than a 100 articles, which are starting to be cited by the research community. The top 5 cited papers published in Microbial Cell, so far (according to Google Scholar), are: Arlia-Ciommo et al., Teixeira et al., Peleh et al., Spincemaille et al., and Scheidt et al. Finally, we have received groundbreaking reports and outstanding reviews from world-leading scientists, including articles by the groups around Alexander Varshavsky, Gerry Shadel, Chris Meisinger, Ed Calabrese, Dimitrios Kontoyiannis, Ida van der Klei, or Guido Kroemer, among others. In the course of this freshly started 2016, Microbial Cell will apply for inclusion in Thomson/Reuters and PubMed Central. We are looking forward to draw our next balance, at the latest when we celebrate our 50th issue together with our authors, editors, referees, and readers. 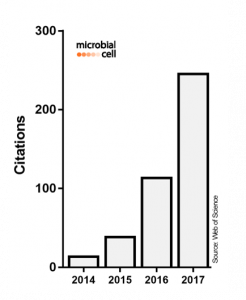 We expect Microbial Cell to have an official impact factor (IF) in the course of 2019. A journal’s IF is calculated by Thomson Reuters/Clarivate Analytics based on the data retrieved by the Web of Science and published every year in the Journal Citation Reports. 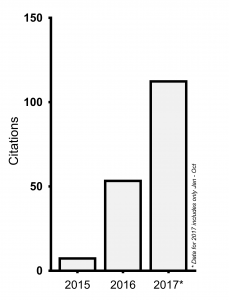 However, an IF is only calculated for the journals listed in the so-called Science Citation Index Expanded (SCIE), which covers only publications that have passed a rigorous and long selection process by Thomson Reuters/Clarivate Analytics. This selection process can take several years, since it is monitored how a given journal establishes itself in the respective research community. Microbial Cell, as a young journal run by scientists through an independent Publishing House (Shared science Publishers), has been followed by Thomson Reuters/Clarivate Analytics in the course of the last years with very positive reviews. Thus, in 2015, we were included in the so-called Emerging Sources Citation Index (ESCI), a selection of developing journals picked by Thomson Reuters/Clarivate Analytics for their potential to be accepted in the SCIE. This draft is made based on the journal’s publishing standards, quality, editorial content, and citation data. As an ESCI-selected journal, Microbial Cell is listed in the Web of Science (since 2016) and will be evaluated to be included in the SCIE in the course of 2018. To sum up, after more than four years of a highly selective process to obtain an official IF, we expect Microbial Cell to have one in the course of 2019. On October 29th, from 5:30-9:00 GMT, we will perform maintenance work on our server to improve the performance and availability of our homepage. During this time, Microbial Cell may be partially or completely unavailable for short periods of time. We will make every effort to complete the maintenance process as soon as possible. Apologies for any inconvenience and thank you for your understanding! The 2nd Theodor Escherich symposium on medical microbiome research is organized by scientists at the Medical University of Graz and will take place in Graz (Austria) on October 19th. It will host international experts in the field that will cover topics including microbiomes in extreme environments, the contribution of the microbiome to gastrointestinal inflammation, microbiome & metabolism, as well as computational approaches for microbiome research and the diagnostic application of microbial community analysis. Please visit the official conference website for more information, including the program and venue! Note that online registration is mandatory but free of charge. It is our pleasure to announce that Shared Science Publishers has been accepted as a publisher member of the Directory of Open Access Journals (DOAJ) after an evaluation period of almost four months. In the course of this application, Microbial Cell has been accepted to be indexed in the DOAJ, the reference guide for quality open-access, scholarly journals. You may find the entry here. DOAJ is a whitelist of open access journals and aims to be the starting point for all information searches for quality, peer reviewed open access material. Thus, it aims to be comprehensive and cover all open access scientific and scholarly journals that use a quality control system to guarantee the content. Importantly, a DOAJ membership is a clear statement of intent and proves a commitment to quality, peer-reviewed open access. Accordingly, Microbial Cell adheres to the Principles of Transparency and Best Practice in Scholarly Publishing as elaborated by the Committee on Publication Ethics, the Directory of Open Access Journals, the Open Access Scholarly Publishers Association and the World Association of Medical Editors. After an evaluation period of almost one year, Microbial Cell is proud to announce that it is now indexed in the Chemical Abstracts Service (CAS) databases. CAS is the prestigious division of the American Chemical Society that represents the largest collection of information on disclosed chemistry and related research, making it the world’s authority for chemical information. Applications for inclusion in further repositories are underway. Microbial Cell is now a member of the Publishers International Linking Association, Inc. (PILA), a non-profit, independent organization, which operates CrossRef. The CrossRef network was founded to make reference linking throughout online scholarly literature efficient and reliable and develop other services that are best achieved through collaboration. As a DOI registration agency CrossRef, enables links to and from online scholarly content and is committed to long term sustainability. A DOI is a unique alphanumeric string assigned to a digital object – in this case, an electronic journal article. In the CrossRef system, each DOI is associated with a set of basic metadata and a URL pointer to the full text, so that ituniquely identifies the content item and provides a persistent link to its location on the internet. Thus, each article published so far and in the future by Microbial Cell will obtain a unique DOI identification number that will be displayed as part of the paper’s reference. MIC proudly announces that it has partnered with the Austrian National Library (http://www.onb.ac.at/) to ensure digital long-term archiving and perpetual access to its complete content and thus to all published articles. This partnership secures that the information stored in this repository will outlast the transience of digital information carriers. Microbial Cell is now indexed in RoMEO, the searchable database of publishers’ copyright and self-archiving policies for pre-prints and post-prints of SHERPA Services (UK). Furthermore, Microbial Cell has been accepted for indexing in Open J-Gate, one of the largest e-journal indexing platforms. Applications for inclusion in other indices are currently underway. Microbial Cell and its publisher Shared Science Publishers are pleased to announce that they have been accepted to join HINARI, a program led by the WHO together with major publishers to enable low- and middle- income countries to gain access to biomedical and health literature. Currently, there are more than 5700 institutions in more than 100 eligible countries, areas and territories registered for this program. The information resources cover the subjects of basic science, biochemistry, biotechnology, cardiology, clinical medicine, dentistry, education, environmental sciences, ethics, general medicine, geriatrics, HIV/AIDS, immunology, infectious diseases, microbiology, nursing/allied health, nutrition, OB/GYN, oncology, parasitology, pediatrics, social sciences, surgery, toxicology, tropical medicine, and zoology. To learn more about it, visit the HINARI homepage. You can find Microbial Cell‘s entry in HINARI here. Inaugural issue of Microbial Cell successfully launched! The first issue of Microbial Cell (MIC) has been launched this January: its content reflects the heterogeneity of the microbial field as well as the purpose of this peer-reviewed journal: to act as a connecting hub for high-impact and quality research in the area of unicellular organisms (and multicellular microorganisms). MIC’s regular issues are released monthly; however, accepted papers may be found as advance publication articles prior to the release of the issue they have been assigned to. MIC runs as an open access online journal thus allowing unrestricted and free access to all published articles. Please, take a look at MIC’s high class Editorial Board and roam through the website to learn more about the journal. You may also consider submitting a manuscript to MIC and as a MIC author promote the microbial research field through this new platform.